The world-class veteran ran a new indoor personal best of 50.36 to finish third in the final behind a French and a Spanish athlete. This was the fourth individual World Championship bronze for Brown, who won the previous three in outdoor competitions. The 40 year-old will go again later this week in the 4x200m relay. He has also entered the 800m but is yet to decide whether to race. 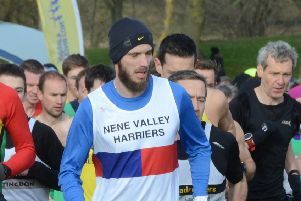 Spalding-based Harrier Paul Parkin has also been in action in Portugal, finishing as third scorer for the eighth-placed Great Britain and Northern Ireland team in the Over 50 outdoor cross-country race. Parkin, who is on the comeback trail, was a class act in his younger days, once finishing runner-up behind Giovanni Rizzo in the Great Eastern Run. Nene Valley’s Evie Hemmings and Natty Clifford were in action in the English National Primary Schools Cross-Country final at Prestwold Hall, Loughborough on Saturday. 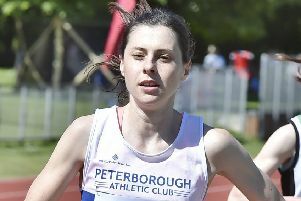 Hemmings finished a pleasing 64th out of 344 in the Year 6 race, working her way through the field as the race developed. Clifford also ran well finishing 178th in the Year 5 race. Bushfield Joggers Tracy and Ian McCartney took part in the Maverick Half-Marathon at Princes Risborough in Buckinghamshire on Saturday. Times were immaterial on a stunningly beautiful but extremely challenging course, with very little flat land on the run. Tracy McCartney had a good day finishing 20th overall and second female in a time of 1:48.59. There was less than 50 seconds between the first three ladies as they jockeyed for position all race. Ian McCartney also acquitted himself well finishing 72nd out of 258 competitors in a time of 2:07.31.